How many years has it been since a Senate session was riveting and awe-inspiring? Far too many. But Rand Paul was cheered by most in attendance when he finally yielded the floor after nearly 13 hours. 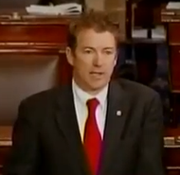 It was applause for Senator Paul, who maintained statesmen-like and gentlemanly demeanor throughout the filibuster, and applause for the triumph of our Constitution. Bravo Senator Rand Paul! Bravo!